Following this morning's appearance of the first trailer for Metal Gear Solid V, David Hayter has apparently confirmed that he won't return as the iconic voice of Solid Snake. "Well look, at least I had a good run." That simple message was written by voice actor, writer and director David Hayter on his Twitter account a few hours ago. The run he was referring to was his tenure as the iconic voice of gaming's most popular spy, Metal Gear Solid protagonist Solid Snake. As most of you are already aware, the debut trailer for Metal Gear Solid V was released earlier today, and fans immediately questioned Hayter as to his involvement with the project. Though the Hollywood jack of all trades offered no specifics, it appears the he's not been hired to reprise his role for Snake's latest adventure. Following that initial tweet, a fan pointedly asked Hayter if Konami had even attempted to hire him for the role, and his reply was short and to the point. "Nope," Hayter states simply. This is sad news for those who've become accustomed to Hayter's gravelly baritone, but it must also come as a terrible shock to Hayter himself who has often expressed a great fondness for the role, both as an actor and as a genuine fan of gaming. 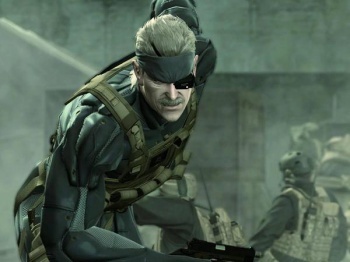 When Silicon Knights remade the original Metal Gear Solid for the GameCube in the form of Metal Gear Solid: The Twin Snakes Hayter reportedly lobbied fellow voice actors to return for the title expressly so it would be an accurate recreation of the original game, at least aurally. The big question now is which voice actor Konami has tapped to fill Hayter's undoubtedly large shoes. Hopefully the company won't leave us waiting long for this revelation as it seems increasingly crucial now that Hayter is apparently off of the project. Our only hope is that Konami didn't hire one of gaming's more cliche voices. We enjoy the work of Nolan North and Steven Blum as much as the next person who's played a thousand games featuring their vocal talents, but Solid Snake is a uniquely gruff character who deserves better than the same, tired voiceover featured in a half-dozen random goons found in any given Activision or EA shooter. Oh, and don't think we haven't considered the possibility that this might be an elaborate ruse courtesy Hideo Kojima. The man loves to play games with his fans' expectations - Metal Gear Solid 2 is proof of that. If it turns out that Hayter has been enlisted to mislead Metal Gear Solid devotees at the behest of Kojima, we reserve the right to tip our hats to the Metal Gear creator and update this story with praise for his hilariously twisted sense of humor.